Many of my clients tell me “I don’t have time to write blogs” and “My pages are more important than my blog” or “I don’t want to write blogs, just SEO my pages”. And frankly, we can do that. We can take a stale site, that doesn’t get updated, and work on title’s, on page copy, and tagging with no problem. But I promise that a Blog is one of the best tools out there to increase your ranking! A Blog section of your Website provides you with the ability to write compelling content that fits with your website but doesn’t necessarily deserve a nested place in your navigation. This gives you the ability to use keywords, and content to increase your ranking. Additionally writing Blogs regularly allows you to make Google, and Bing see your site as being updated (Assuming you have an automatic submission to sitemaps installed on say WordPress). The Site Traffic, Backlinks are both spawned by providing (either automatically or manually) the content to social platforms. Additionally using social sharing models (like a “Like Button”) allow people to backlink to your content from these systems, hence allowing their friends to see your site, and therefore increasing your site traffic (assuming you are writing good content). Cross linking is also very easy to accomplish in your blog. You can even see in this post where we linked to words like SEO or compelling content. See simple! This allows search engines to see other important areas of your site, as well as shows an importance of these pages. 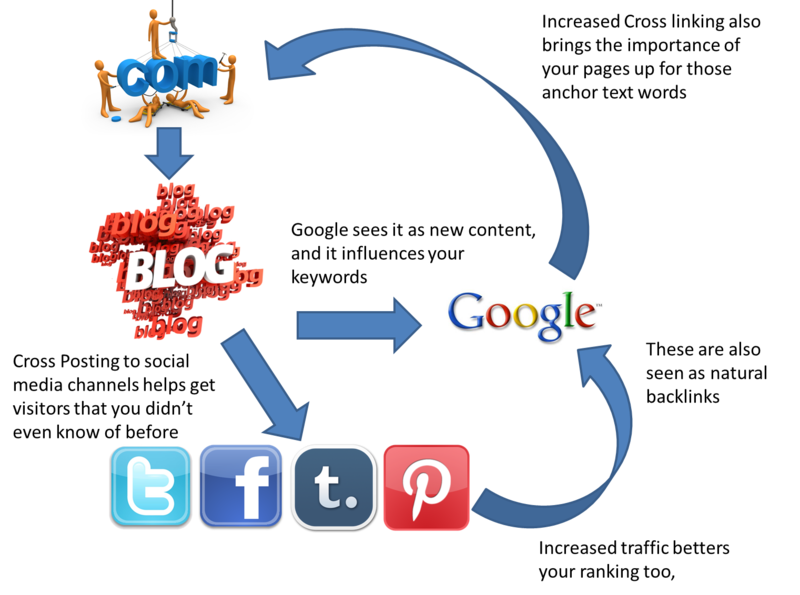 So as you can see, your blog CAN, and more importantly WILL increase your page listings on search engines. Write them often, write good content, and remember… it is easy to do!